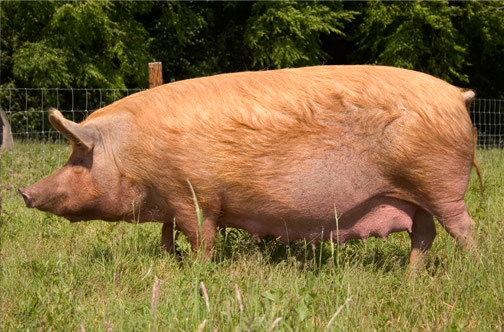 Today's Tamworth is thought to be the most typical breed descended from the old indigenous species, the Old English Forest pig. It has maintained this status because at the end of the 18th Century, when many native breeds were 'improved' by crossing them with Chinese and Neapolitan stock, the Tamworth was not deemed fashionable and hence left alone. It is now therefore the oldest pure English breed and, as a result, it is also sometimes crossed with wild boar to produce distinctive gamey pork. During the 20th Century Tamworths were both exported and imported; an exercise vitally important to a breed with small numbers and potential inbreeding problems. During the early part of the century the imports were predominantly from Canada, one famous one being 'Dollar Bobbie' whose progeny resulted in the Rose line (no relation to the modern day Golden Rose). 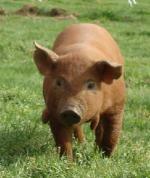 The red-gold hair of the Tamworth ensures that it is one of the most easily recognisable of the traditional pig breeds. A typical Tamworth has the longest snout of the present day domestic breeds. It has prick ears, giving it an alert appearance. This reflects its inquisitive nature - a characteristic enforcing its reputation for speed within the Show ring. A Tamworth's head should not be too long - the face should be slightly dished and wide between the ears, with a light jowl. The large ears are finely fringed and carried slightly inclined. The skin should be flesh coloured and free from coarseness, wrinkles or black spots. The coat is distinctively golden red, abundant, straight, fine and as free of black hairs as possible. The sows are excellent mothers, being milky, docile as well as protective. As with all traditional breeds, the Tamworth is hardy and can be kept in environments ranging from rough pasture to meadowland. Of all the native breeds it is particularly resistant to sunburn. Well over a century ago, when landowners, farmers, hotel keepers and cottagers kept pigs to cure their own bacon, the Tamworth enjoyed popularity due to its ability to produce white-fleshed carcases with long sides and big hams. As the breed's name suggests, these pigs are traditionally remembered as cottagers' pigs in the Midlands. After World War II, breeding stock numbers fell dramatically - to a point during the 1970's when there were only 17 surviving boars. At this time it was felt that the Canadian pigs were a darker red than was preferred and the breed turned to Australia for its importations - a country that had previously imported from Britain. The Rare Breeds Survival Trust continued this tradition with two importations. In 1976 several boars were imported from the Royal Standard, Golden Ranger and Glen lines and in the late 1990's the importation was of both boars and gilts. On this occasion the boars were incorporated into all the female lines and a further female line, 'Rita' was established.